I could write all day about “Birders.” There are so many things to like about it. But one segment that’s still in my head is when the narrator asks a group of four long-time Central Park birders a simple question: Do you ever get tired of looking at a cardinal? No, of course not, they answered. “If you get tired of looking at the common birds then you might as well just pack it in,” said one of the grizzled vets with a thick New York accent. Nodding heads all around, including mine. Birders know that all birds are worth watching. Many of the common ones, fortunately, are strikingly beautiful and practice interesting behaviors. The common birds are also the entry point for beginning birders and potential future birders. At Cantigny Park in Wheaton, my employer, we’re in the second year of a Bird of the Month program. The idea is to “celebrate” easily seen species that park walkers and golfers might encounter during their visits. We’re not trying to create new birders—it’s more about raising awareness and sparking some curiosity. Hopefully Bird of the Month has helped a few people put a name to a bird that they’ve been seeing for years. 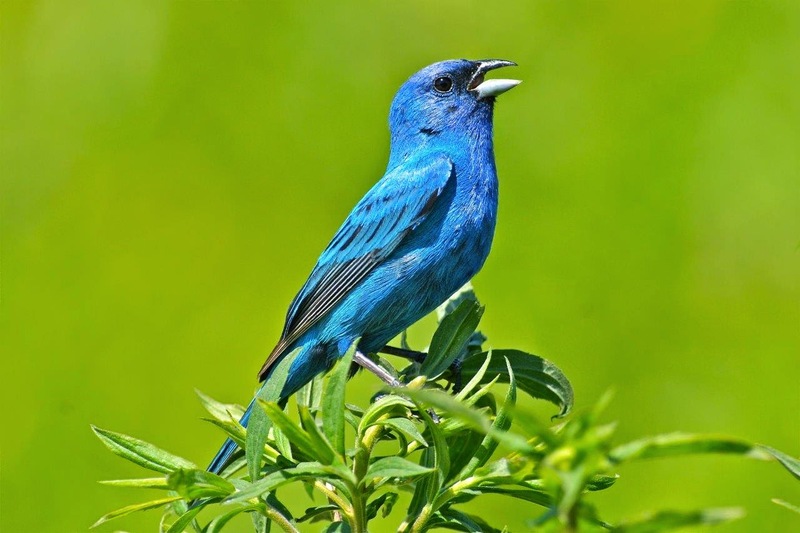 Maybe it was an indigo bunting, the electric-blue summer songster that’s surprisingly common in certain places of the park. The attention-getting photos on our Bird of the Month banners are key. I am indebted to talented contributors including Jackie Bowman, Jim Frazier, Glenn Kaupert, Christian Goers and Leslie Morrison. Their bird images sometimes accompany this column, too. For me, the fun part about Bird of the Month is choosing the species and then gathering some interesting facts about them. The process is a reminder that there’s always something new to learn about our common birds. Did you know the oldest great blue heron was 23 years old? Or that barn swallows breed on every continent except Antarctica? I also confirmed that purple martins don’t eat many mosquitos. They much prefer larger insects such as dragonflies. Birds are never boring, and the common ones occasionally surprise us. This past spring and early summer I witnessed something I’d never seen in 17 years of watching my Glen Ellyn backyard: a peanut-eating American robin. The bird was up on my shelled peanut feeder constantly but too plump to stay on the perch for long. It spent more time on the grass below, picking up peanut bits just like a squirrel. The robin even adapted its behavior, learning that the best time for a peanut fix was when another bird was on the feeder. The bird above became the robin’s ally, causing peanut fragments to drop into the grass. It was amazing to watch! Several times this summer I observed a male cardinal give a sunflower seed to his mate, passing it from bill to bill. A nesting pair of downy woodpeckers also captured my attention. They set up shop in a dead snag two houses down but easily visible from my driveway. I suspect that blue-gray gnatcatchers nested in another neighbor’s tree but was never able to confirm it. Yes, there is always something to learn about birds just outside our doors, and usually it’s a common species delivering the lesson. 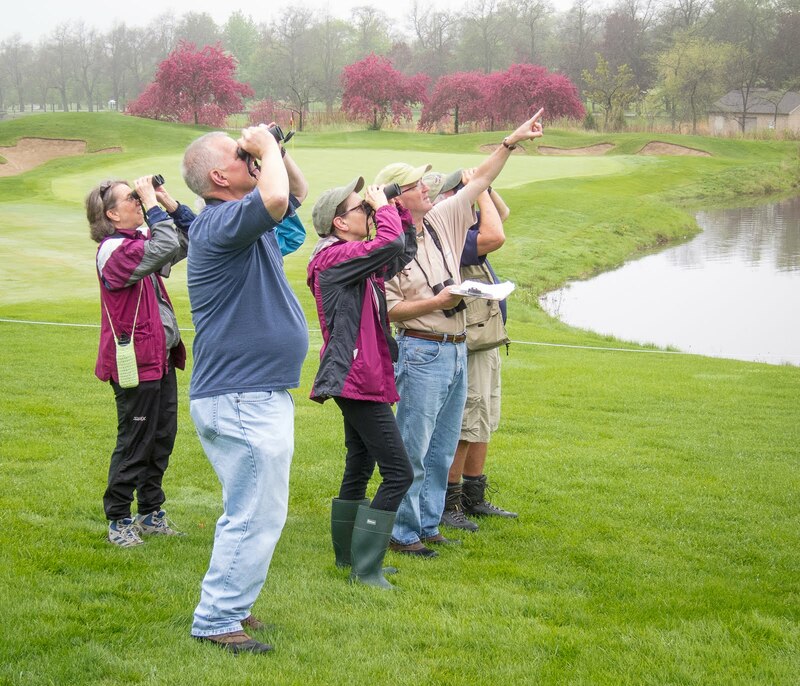 Back at Cantigny, our monthly bird walks, like most field trips, seldom turn up anything truly remarkable and rare. But they nearly always produce an interesting discovery. The danger is going too fast. In our quest for the unusual we sometimes need to slow down and be sure to appreciate the familiar jewels that invariably brighten the day. I believe cardinals, blue jays and goldfinches raise our spirits even if we don’t realize it. Their sounds alone enrich the precious time we spend outdoors, whether we’re birding or just going about our daily business. It’s not just the flashy birds that have this effect. Hearing or seeing a house wren, catbird or white-throated sparrow can do it, too. A noisy, swirling flock of sandhill cranes—fairly common above our heads in spring and fall—gets me every time. “Where is it written that great birding experiences must ever and always involve rare or unusual species?” asks birding guru Pete Dunne in the current issue of BirdWatching magazine. Not here, that’s for sure. If it has wings, I’ll watch it. Including that bright red one with the handsome crest.